Why settle for ordinary chain hotels when located just above the Thyme Market and The Copper Fish are five beautiful overnight suites. The Thyme, Rosemary and Sage rooms are up-scale accomodations with wonderful antique furniture and oriental rugs, fine linen and bedding, large-screen TVs with satellite programming, and exquisite bathrooms. The newly added French and Italian rooms are "over-the-top" spectacular with the finest antique furniture, wonderful marble bathrooms with soapstone lavatories, and unbelievable wall and window treatments. The close proximity to It's About Thyme, the Thyme Market and The Copper Fish ensures the availability of fine food and drink for in-room dining. The Thyme Room can also accomodate private parties up to 18. 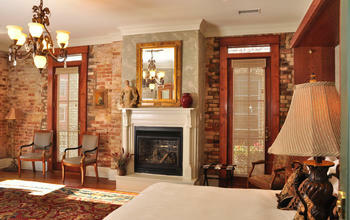 The Italian Room, with its adjoining terrace can accommodate parties of up to 40. 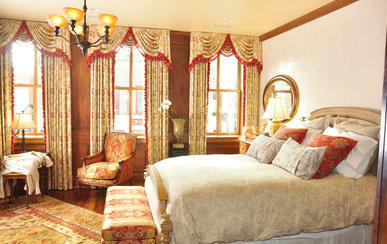 Click here to view our overnight suites.